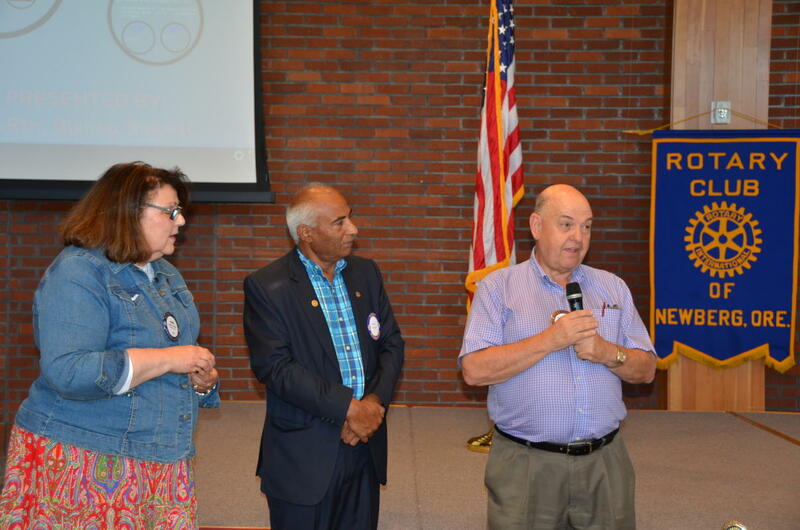 Bishnu discusses Rotary projects in Nepal. 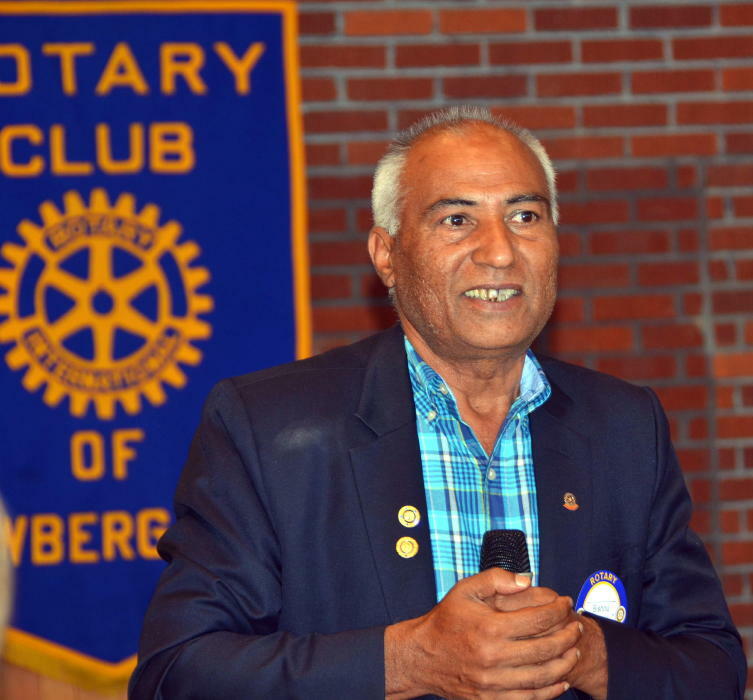 Our very special guest last week, Bishnu Subedi, a Rotarian from Nepal, was talking about his role in the global grant projects he accomplishes with various Rotary clubs around the world– including ours–to help make his country a better place. His Kathmandu club’s relationship with ours came about through International Director Laura Tilrico, who has known Bishnu since her earliest days in Rotary. They have accomplished a number of important projects together, including two with our club–a dental clinic and a drinking water storage/supply project. “Right before 2000, the Children’s Hospital of Cincinnati donated some emergency supplies to my club. I posted them online and Bishnu responded,” said Laura about their first meeting some 17 years ago. 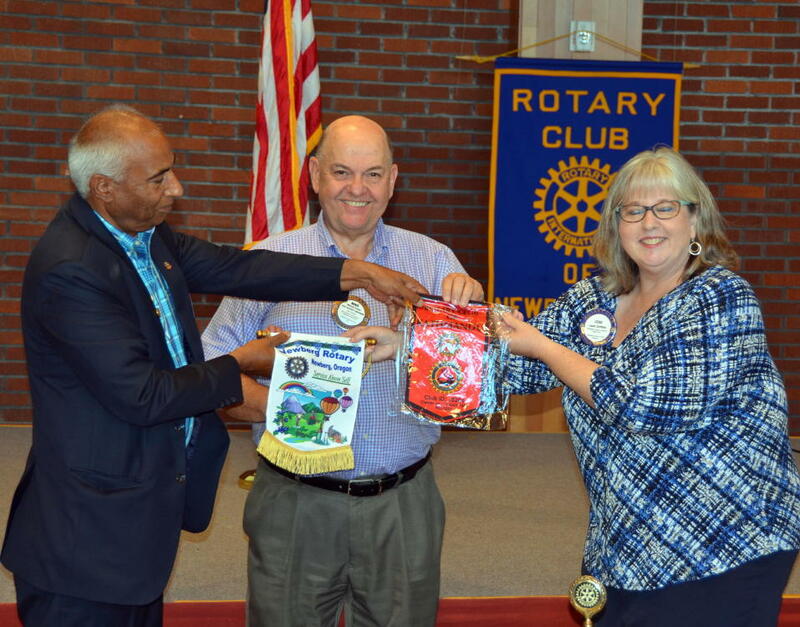 Bishnu, Mike Caruso and President Leah Griffith conducted a flag exchange between our club and Kathmandu’s. According to Bishnu, Nepal is known for its beauty, and is rich in culture and nature. “Everyone knows Nepal for Mt. Everest, but not everyone knows that Kathmandu is known as the ‘City of Temples,”’ he said. 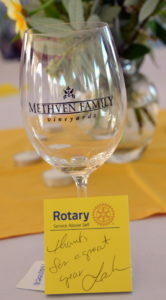 The Kathmandu Rotary Club was started in 1958 and was the first Rotary Club in Nepal. Bishnu brought a club flag to exchange with ours as part of his program. Bishnu thanked Laura and our club, and described some projects in his club’s pipeline, including a rainwater harvesting project, a women’s empowerment project, establishment of an e-medical clinic for people with no access to a medical facility or doctors, providing solar energy for a dialysis center located in an area without a stable electrical supply, and establishing a technical training center for youth. Looks like there will be opportunity to continue to work with this special Rotarian who really does everything! BUT WAIT, THERE’S MORE—A PAUL HARRIS AWARD! Mike Caruso and Laura Tilrico present Bishnu with his Level 7 Paul Harris award pin. 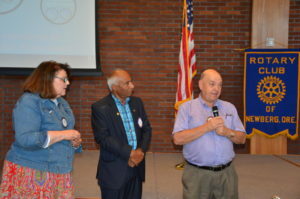 Special arrangements were made to secure Bishnu’s Level 7 (meaning he has contributed more than $8,000 to the Rotary Foundation) Paul Harris award pin ahead of time, so that it could be presented to him during his visit to Newberg. Congratulations, Bishnu! Bishnu was accompanied by his wife, Pramila. Laura Tilrico’s sister-in-law, Marni Tilrico, also joined us. Dr. Eric Bergquam brought his assistant, Anina Chism, who accompanied him on the recent dental mission to Nepal. AND WHAT AN INSTALLATION BANQUET! President Leah acknowledges her board. 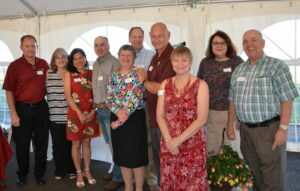 Incoming President Todd Engle and his board. You should have received your tickets, but if not, please see Curt Walker. Your packet will have 8 adult tickets at $7 each and 4 children’s tickets at $4 each, for a total of $72. Yours to sell, to gift, or…….and while you’re at it, please be sure you have signed up to help out at this important event. Congratulations to LeRoy Benham and his wife on 59 years of marriage! And congrats also to Geoff Gilmore, whose son is in Japan, but is getting ready to finish up at the University of British Columbia. 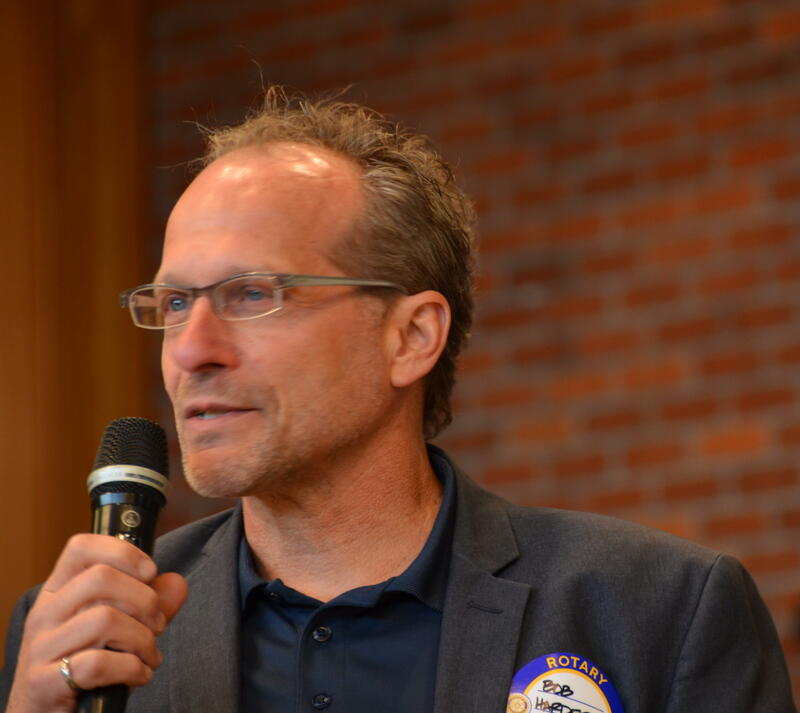 It was great to see Don Skei at our meeting last week. So glad he and Dawn McClard could join us. If you haven’t already, please respond to the survey the Program Committee sent you via email. Your ideas and input are needed on the kind of programs you would like to see in the 2017-2018 year. Thanks in advance. Early warning! 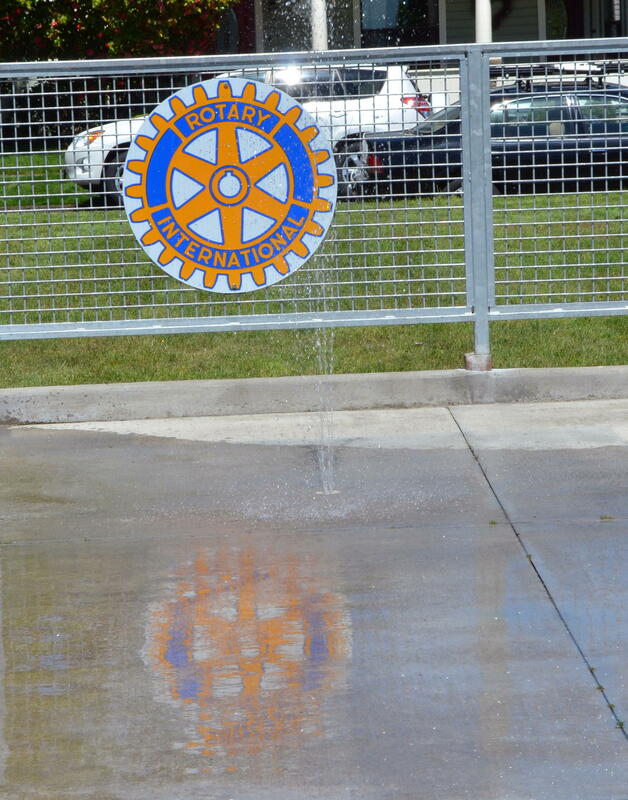 Our July 5 meeting will be at Friendsview. Members of the NHS Robotics Team. 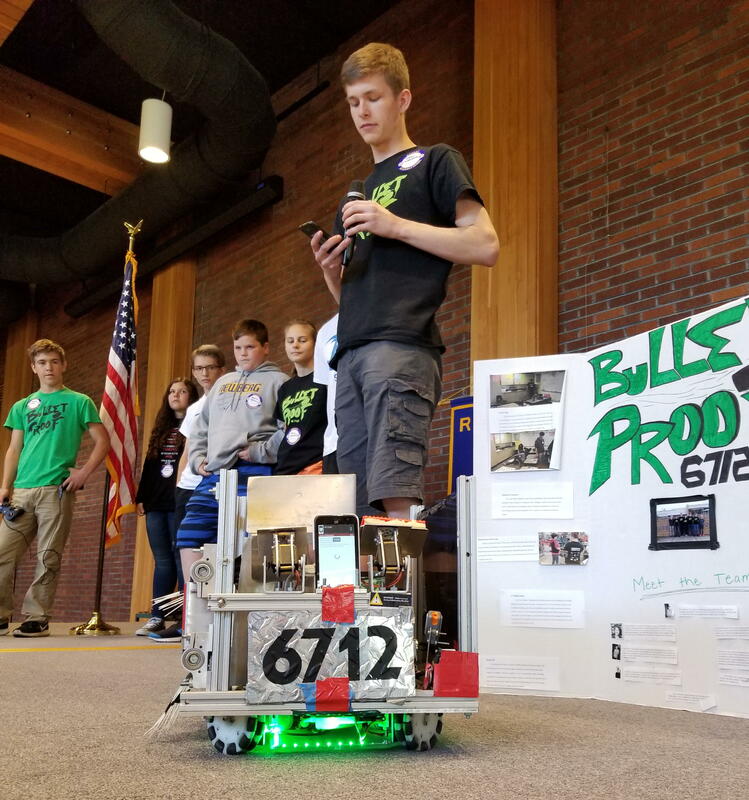 Members of two of the four Newberg High School Robotics Teams–“Beta Pi” and “Bulletproof”– joined us last week to “show and tell” about the creations that took them to the state championship this year. 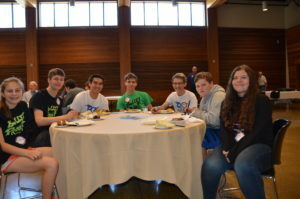 What fun to see how their robots were designed and ultimately functioned to meet this year’s contest criteria…. to shoot whiffle balls into hoops and to lift a “yoga ball” onto a center stand. Senior Drew Thrasher demonstrates one robot’s capabilities. All of the robots operate through Android phones, so the kids learnt work with that operating system as well. Total cost for the electronics was quoted as $3000. Each team focused on a different goal. One team showed how their robot could sweep up the balls. The other focused on how the robot could touch a beacon to detect a color on the center hoops. Some of the team members got an early start in robotics, through Ewing Young Elementary School’s Lego Robotics program. At the other end, college prospects look good for the seniors on the team. For example, one is going to Gonzaga in Spokane to study computer engineering. Another received an internship at Boeing because of the experience in computer and mechanical engineering he received in the NHS program. The group thanked the Rotary Foundation for its financial support, which was used to purchase electronics and tournament entry fees. 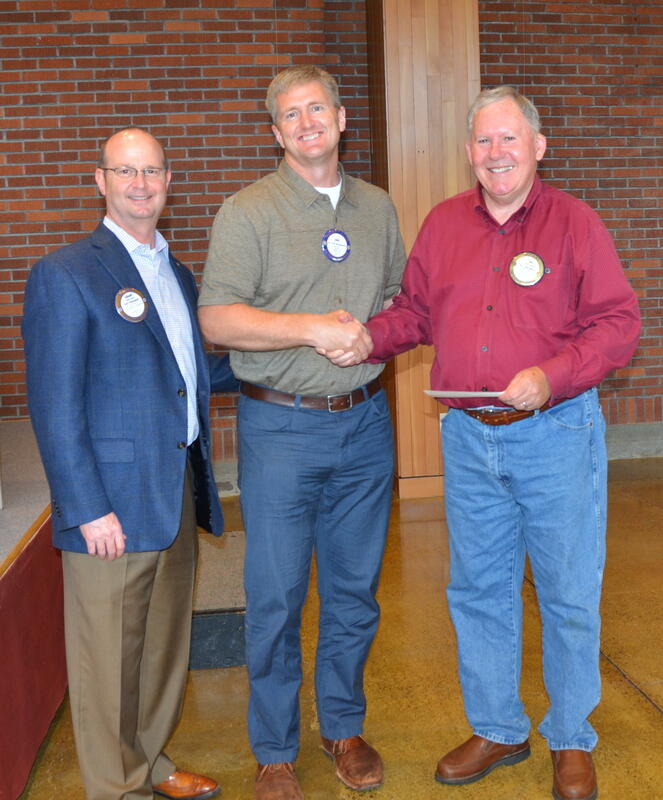 Grant Gerke, left, and Dr. Eric Bergquam present a check to Newberg Rotary Foundation president, Spike Sumner. On behalf of the Rotadent board (made up of 3 members from the Noon club and 3 from the Morning club, plus a liaison from Adec and a liaison from the Austin family), Dr. Eric Bergquam and Grant Gerke presented a check for $100,000 from the proceeds of sales to Newberg Rotary Foundation president Spike Sumner. A similar check will go the morning club. 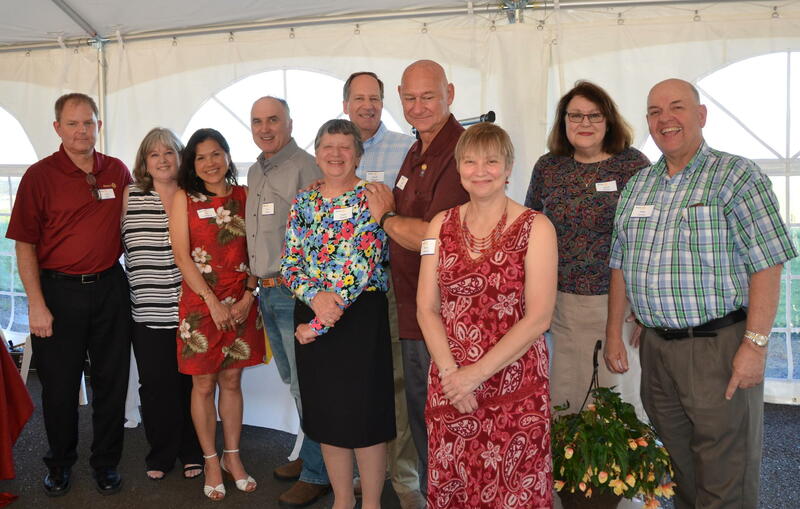 According to President Leah Griffith, our clubs are so fortunate to have this source of funds, which this year allowed our club to award $52,000 in local scholarships and do lots of other good things in the community. 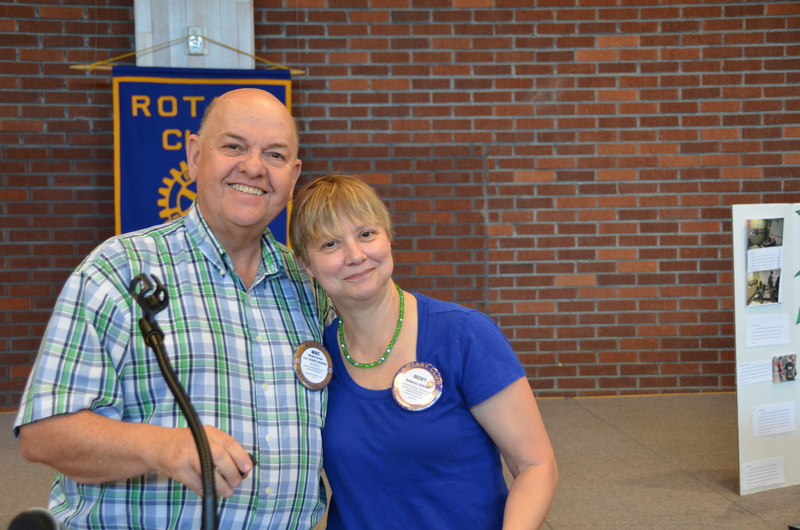 Mike Caruso made a Paul Harris presentation last week that he said was very special: five-year member Becky Ankeny was FINALLY getting her Paul Harris pin and certificate. Congratulations and thank you for your patience, Becky! Did you know there is now a club within our club–a “clublet,” so to speak–called “Eat Dessert Before Lunch” ? 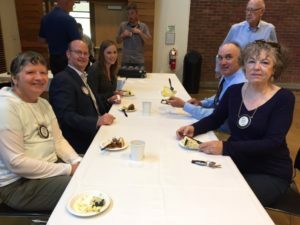 Paula Radich, Grant Gerke, Guest Shannon Buckmaster, Julie Want, and Terry Weldon were seen gathered together eating lemon cake as we arrived for the regular meeting. Not sure exactly what motivated this. Because life is short? Because they missed out on some desserts awhile back? Because they just like to socialize over sweets? Whatever the reason, if you would like to join in, just show up a little early, grab a dessert and look for the table of smiling Rotarians! Plus 8 to 10 members of the Newberg High School Interact Club. 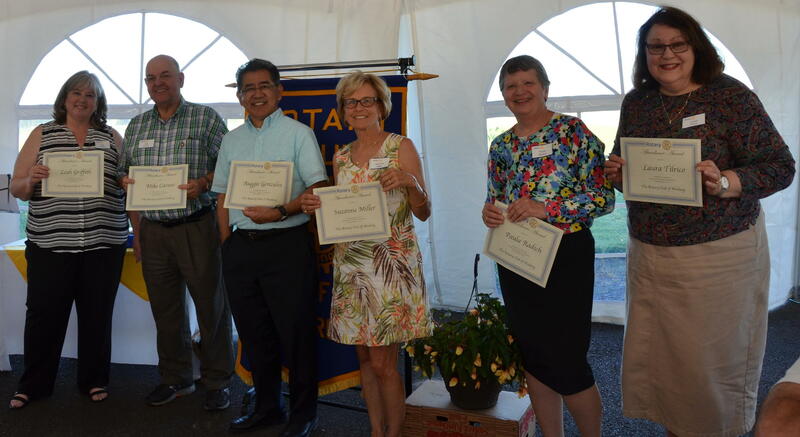 Denise and Judy are Rotarian mentors for the Interact Club. Shannon Buckmaster was introduced by Grant Gerke. Shannon’s application for membership in the club is in process. Leona Todd‘s mom, Kate Phillips, was visiting from San Diego and joined us for lunch. Geoff Gilmore introduced GFU student Dominique Thibault, who will be our club’s summer marketing intern. Dominique participated in George Fox’s Juniors Abroad program, and visited Jordan, Israel, Spain and France. A group of club members met with Dominique after the meeting to discuss ideas for increasing awareness of Rotary in the community. 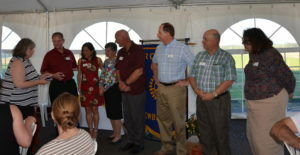 Paula sent out email sign up lists for the June 22 Installation Dinner and the July 28-30 Pancake Breakfast weekend. Please be sure to get your name on those! And don’t forget to talk to Om Sukheenai if you have an entertainment talent you’d like to share at the Installation Dinner. Spike Sumner is leading the effort to find pancake breakfast sponsors. Interested? Please talk to Spike. Lynn Montoya Quinn told us about a couple of upcoming events scheduled in PCC Newberg Center’s Learning Garden. Learn all about natural cob building with clay, sand and straw at a workshop on Saturday, June 10 from 9am to 1pm. Or, join a planting party on Wednesday, June 14th from 3 to 6 m. Learn how to sow a vegetable garden and take home some seeds. 135 Werth Blvd. For more info, contact Moonrose Doherty at 971-722-8610. The Peace Committee will meet this Wednesday at 11am before the regular lunch meeting. Come hear about interviews conducted last Saturday of potential candidates to be sponsored by District 5100 for Rotary Peace Fellowships, about plans for a peace pole map and brochure, and about plans for the Peace Conference June 9 and 10 at the Rotary International convention in Atlanta. Corey Zielsdorf’s daughter was inducted into the National Honor Society. Congratulations! The new Habitat for Humanity Restore store at 801 North Meridian St. is now open Friday and Saturdays. A grand opening will be held June 17 at 11 am. Mike Caruso’s son’s musical, “Dundee,” was one of three nominations for Chicago’s “Best Musical” award. The other two were both by Lin-Maneul Miranda, creator of the smash hit, “Hamilton.” Very prestigious company to be in!